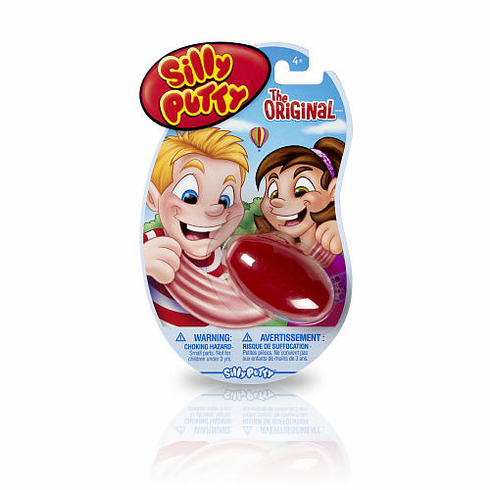 Silly Putty, The Real Solid Liquid, has been the standard of excellent fun since 1950. Silly Putty is a very unique substance. It stretches without breaking, yet it can be "snapped off" cleanly. It bounces higher than a rubber ball. It floats if you shape it a certain way, yet sinks if shaped in other ways. It can pick up pencil markers from pages and comics from some newspapers. If you slam it with a hammer, it keeps it shape, yet if you push with light, even pressure, it will flatten with ease. This product has a small parts warning - not for children under 3 years.